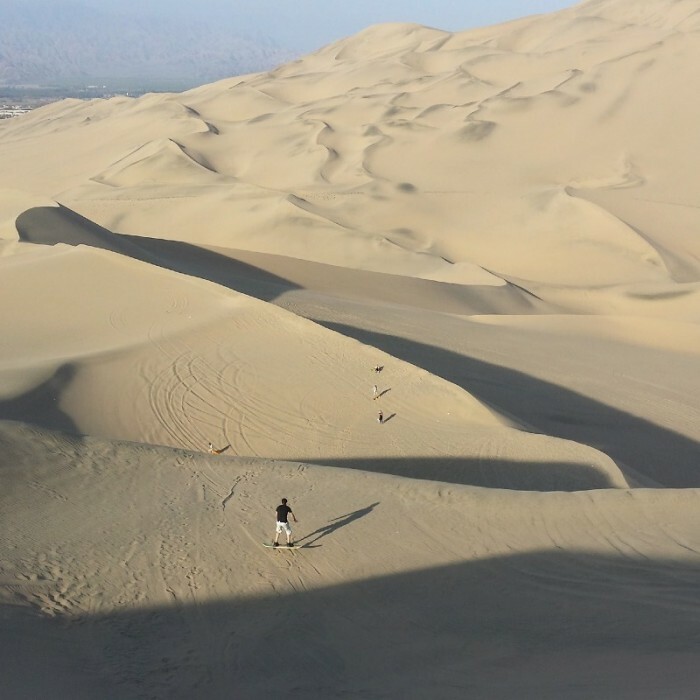 The best place in Peru to go sandboarding is Huachachina. It’s a tiny little town situated between the tourist hotspots of Paracas and Nazca and exists primarily for tourism. It’s South America’s only oasis and is surrounded by vast expanses of sand dunes. Sand dunes perfect for dune-buggying and sand boarding! Two or three nights are enough to spend in this cute little town. With that you’ll have plenty of time to relax by the oasis and get out on the dunes. Getting to Huacachina is easy – you can get a bus to Ica from anywhere and then just catch a smaller local bus or taxi to Huacachina itself. There are plenty of accommodation options and they will organise the adventures for you. There are so many tour operators in the town, it’s so easy to just choose one the day before you want to go out on your adventure. Using the company that your hostel or hotel uses is the easiest option and will be guaranteed to be of a high standard. The sand dunes are right at your doorstep so you can definitely go climbing and sliding through them yourself, but you’ll need to find something of your own to cruise down them on. Also, the dunes around the town are a bit messy and aren’t the nicest – to get out onto that pristine stuff it really is best to get yourself a dune buggy excursion. The dune buggying is half the fun of your sandboarding expedition and will certainly get your blood pumping! The guide will strap you into the buggy and then hit the gas. Within 2 minutes you’re out of town, flying across the sand, feeling like you’re on another planet. The driver will speed up steep hills and then it’ll feel like you’re falling down the other side. You want to keep your mouth closed as otherwise you’ll cop a mouthful of sand, but it’s hard not to scream out in excitement and fear! This is better than any rollercoaster you’ll ever find in a theme park! For this part of the adventure it is essential to have sun glasses – without them you’ll have to squint your eyes shut to keep them clean and you won’t be able to enjoy the spectacular views. A balaclava or a light-weight scarf is a good option too. You can wrap them around your face so you can breathe clean air. The driver will stop at a number of spots perfect for sliding down the dunes on a board. They’ll take the board off the roof of the buggy, show you how to lay on it properly, then push you off down the slope. SO. MUCH. FUN! It’s important to wear clothes that will cover your torso and thighs as these will be pressed directly against the board. Sports clothing is a good idea as it’ll give you room to move. Just remember that every single part of you will come back covered in sand, so wear something you don’t mind getting dirty! Closed-in shoes or trekking sandals (men, women) which secure at the back are a must – any flip flop or loose fitting shoe will come off and disappear into the sand. Sunblock for your face and body and water are essential as it gets HOT out there and the sun is fierce. Cameras are a must as the views are breathtaking, encompassing the dunes, the deep blue sky, and snow-capped mountains in the distance. All your stuff will be safe in the buggy while you are sandboarding – there’s no one else out there! The only safety aspect to consider is that the buggy is not enclosed at all and you’ll be thrown around like you’re in a washing machine. This is fine for yourself as you’re strapped in with seatbelts, but you won’t want any of your stuff to be loose as it will be flung out of the vehicle and you’ll have zero chance of going back to find it! A daypack that you can put everything in and strap across your body to hold onto is a great option. GoPro camera is really the best option for this excursion. Take the head-mount for your GoPro and because you’ll be laying on your stomach on the sandboard so a body mount won’t work! Smaller cameras or even smartphones (don’t forget your monopod) are more useful than a big DSLR during the actual sandboarding because you can tuck them in a pocket (only one with a zip though!) or in a little body belt and slide down the hill with them. Then you have them at the bottom of the dune to take more pictures of your friends making their way down! It’d be impossible to do that with a bigger camera. You shouldn’t need to bring food if you eat beforehand. The excursions are only a few hours so you’ll be back in time for the next meal. Going out later in the afternoon is the best time to do it as the sun loses some intensity as it sets and the light makes the stunning views even more spectacular. Make sure you pack your swimsuit and travel towel as you’ll want to take a dip in the oasis when you return! And don’t forget some antiseptic wipes in case of small wounds. The buggies fit up to 10 people in them so even if you’re with a large group of friends you can all join in together. This adventure is the perfect mix of adrenaline pumping and totally safe. If you’re travelling as a family it’s a great activity to do together. Kids will love sliding down the dunes too! Huacachina is such a unique place to visit and explore during your trip to Peru. You’d be mad to miss it! Get your adrenaline fix on the dunes then do nothing but relax by the oasis. There’s nowhere else in South America like it and you’ll have the time of your life!